WHAT IS THIS PLAIN VIEW HERITAGE FARM DOMAIN ALL ABOUT? This is the COMFY AND COSY AND CHRIST-CENTERED Stadem Home-Place where we can share our Norwegian American Heritage with others. Also where we can meet others of different walks of life, via our guestbook or email, now that it is clear how FEMA and Homeland Security, the NSA, FBI, and the Military cannot save our woeful, under-judgment country from rapid self-destruction but only the Word of God, GOD'S COMMANDMENTS obeyed, can save us! 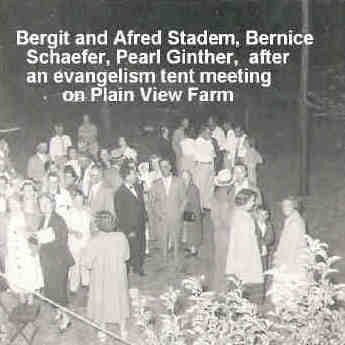 Written probably this year on the other side of the picture are these words of Pearl Ginther: "Tent Grandpa Stadem [her Papa] rented for meetings held on the farm of Plain View." Pearl Ginther, now in heaven, always had a joke or a joke book handy on earth, to lighten up the day whenever needed. Here are some of her chosen jems, straight from her collection in her purse! TIME FOR THE BIG PUSH FOR THE BARN/HERITAGE CENTER! WE NEED 100,000 DOLLARS FOR THE OUTFITTING OF IT! and elders actually had to tell the people to stop giving, they had too much! That is the way it ought to be, and will be, on PVF. It is truly time to give back. Most of my dear loved ones in the relationship are still watching a few give, and they're not going to reap a blessing if they don't sow to God's work now. Yes, we ALL have pressing needs, bills, commitments, agendas--just as the Jews did, but when called upon to give they gave OVERMUCH. They showed they forgot about themselves at least for that time in order to put God first, foremost, highest. That is the spirit that pleases the Lord, who "by the way," gave us EVERYTHING, his very life. Who else has done that much for you, or me? No one, none but Jesus. Start with simple childlike faith in God, surrendering your heart to him as His child, yielding all he has given you so generously while considering it could all be swept away in a minute (as recently happened in Chile, Haiti, New Zealand, and now Japan) except for his grace and mercy. Ready? Next, start with the lowest amount, give that, and keep moving up until you can't go any further, you just don't have the money. The "bell" in heaven sounds at that point, you've given truly sacrificially. Then give again, and again, and again. God will provide for your sacrificial giving! 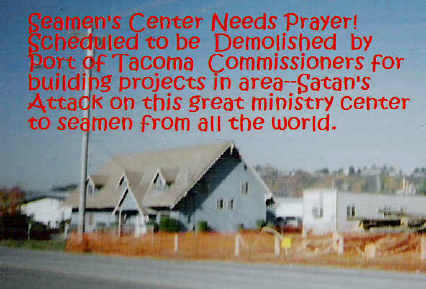 CALL TO DO SPECIAL GOSPEL SIGN PROJECT: Aunt Ruth Stadem Harrington, in 1995, sent a picture of this sign around to family and friends. 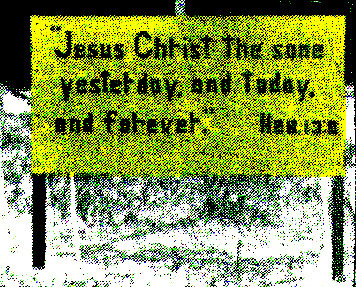 "Jesus Christ the same yesterday, and today, and forever"--Hebrews 13:8, which she wrote was erected by the Bible Crusaders of ND south of Sherwood, ND Port in Tom Harrington's memory. How many souls, going to take their lives in despair, or sunk in alcoholism or drugs or other sins, were turned to God by this wonderful sign since 1995? Eternity will tell us. Is it still there? Or has it fallen down, and is no longer able to call souls to safe refuge in the Lord Jesus? Two previous gospel signs the Stadems and friends put up were in memory of Bob Ginther and Art Stadem, who died in a fatal plane crash in 1947. Pearl Ginther, Bob's widow, turning a glorious 101, said she would love to see the gospel signs re-erected to begin calling souls to the Lord once again. Wayfarers on the highways used to read the the gospel signs and were directed to the Savior, their true spiritual destination. Is there one Stadem descendant today who could build and re-erect the two signs on the public roads round Bryant? Is there one? We build houses, business offices, churches, clinics, and factory and aerospace plants, all sorts of projects have been designed and built and financed by Stadem descendants; and we know in time all such structures will pass away, as they are temporal. Signs too pass away. But the Gospel they preached to travelers on the roads bears eternal fruit: souls saved and won to the Lord forever! 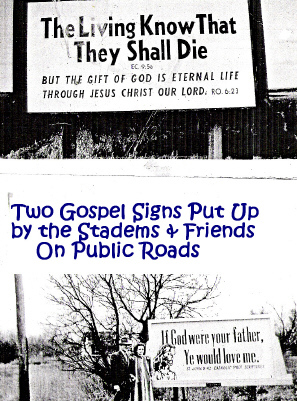 Is there one Stadem descendant who will re-erect the Gospel signs. Once we had two, three when including Tom's. Now we have none, if dear Tom's too has gone down. Who will step in and re-erect these wonderful, soul-saving signs? Pearl gave money to the fund at PVF for gospel signs several years ago, but so far nothing has been done. Who will re-erect the gospel signs? Who? Why not you? Grandma, in telling how things were in Norway when she was still living there, related on tape and in conversation and in writing how the church in Norway where she attended grew cold and formal, so they would go by boat to get to another church meeting in a home and worship God there. The lack of faith in so many Christians in large part drove her literally from her Fatherland! Economics was not her main motivating factor, as American sociologists who don't usually entertain spiritual interpretations like to think it was for all Norwegian immigrants to America. 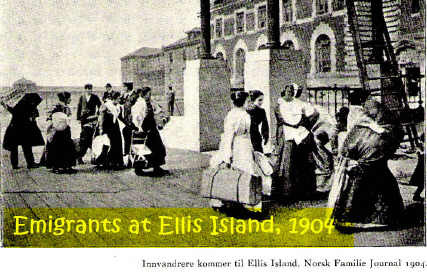 The struggle to sustain life was very hard for a young girl like herself and her sister, but the spiritual lack in Norwegian society was the big reason she left her beloved homeland for a new life in America. She never looked back. In America she found many people with hearts burning with love for God and His people and was well satisfied she had made the right decision, even after a young man once came to try and get her to go back. "Kristine Stadheim: In Heartfelt Memoriam"
Our roots were brought from Norway over the sea. and settled first in Iowa's Worth County. her wedding cape flowed down gracefully. it's found in Norway just the same. a link to Kristine, no little fame. whose blooming she would never see. and like Him she went before us all. 1903 was a great year! From the Franklin Mint Magazine: "Wasn't 1903 a remarkable year? Henry Ford starts his company. The first Harley-Davidson motorcycle is created. And the Wright Brothers rewrite history by creating the first powered aircraft that can actually fly." We also can add to 1903's epic events: Bergit and Katrine's sailing from Norway to America! 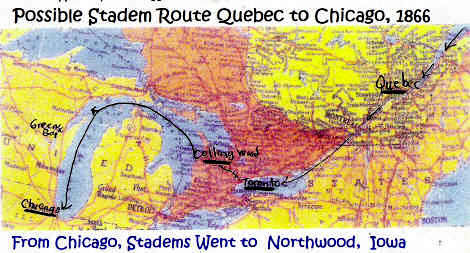 That trip changed history, as far as we Stadems and Holbecks (with or without a "c") are concerned! The Epic Journey of Pioneering Faith made by Katrine ("Tena" Holbek also the fully Americanized "Catherine") and Bergit (Americanized to "Bessie") Holbeck to America on the Norwegian American Line passenger steamship OLAF HELLIG in 1903! Pearl Stadem-Ginther, daughter of Bergit and Alfred Stadem, relates her mother's memories of that voyage: "When my mother Bergit Holbeck (Stadem) and Katrine Holbeck (later Lundring) came over in 1903 to America on the HELLIG OLAF ship from Mandal, Norway, water was coming in on one end of the boat [perhaps from high waves or the wash of the wake]. So to stop it they had to start moving their luggage to the other end so no more water would come in. When the Statue of Liberty appeared, that made my mother happy that it was close to their arrival to S. Dakota, where she got married to Alfred J.P. Stadem and raised 9 children." "Ballad of the Voyage of Faith," Centennial Tribute (1903-2003) of Bergit and Katrine "Tena" Holbeck leaving their family home in Mandal and their epic Voyage from Kristiansand, Norway, to America and the start of new lives. We have received startling information about the Holbeks! Pearl Ginther received a letter and a genealogical extract from Norwegian genealogical archives from Mabel Helland, a Holbek relative residing with her husband in Minnesota! The writer wishes Pearl Ginther a most wonderful birthday, adding by saying that she found out really how small this world is when she lately discovered that she has Holbek relatives, not only here but in Norway. She visited Andreas and Dagny Holbek over in Norway too. At that time Andeas had a Christian bookstore. 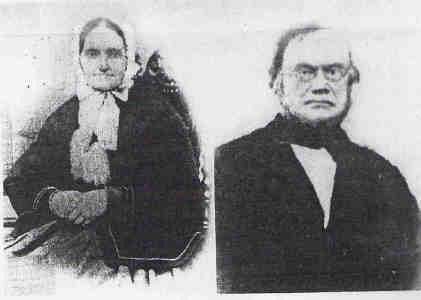 Mabel Helland's husband worked with Joseph Rangen (husband of Estelle Stadem Rangen) in the church planting of the Lutheran Brethren Church for many years. 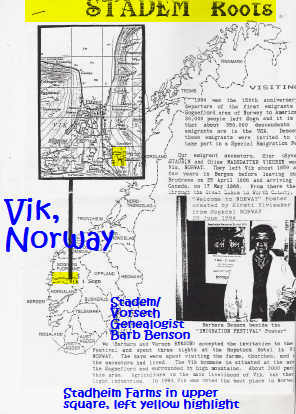 The genealogical extract dealing with Pearl's Holbek ancestors, Andreas and Berta Holbek, who were Bible Colporteurs in Norway, is in Norwegian, and we must seek a translation before we can present it here for your enjoyment and knowledge. Please return for it here, or contact us and we can send you a copy. 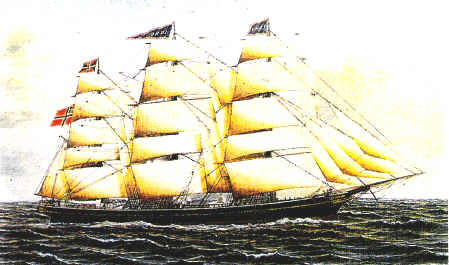 The Stadems of Vik i Sogn and Bergen were emigrants in steerage in a sailed fixed-rigged bark called BODRENE, sailing from Bergen in 1866 via Quebec, Canada. 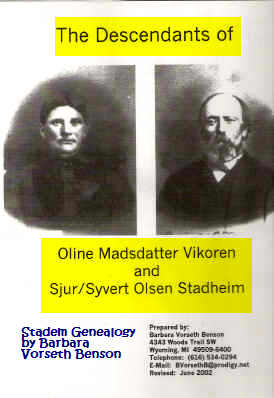 You can trace this truly exciting history and the genealogy of the Alfred Stadem line back to Sjur and Oline Olson Stadheim (and even earlier) in Stadem/Vorseth descendant Barbara Benson's wonderful genealogy book and a printed and illustrated supplement. Sjur/Syvert Stadheim and his wife Oline Madsdatter Vikoren left Norway with their family, sailed on one of those wooden ships with all the sails aloft, and emigrated to Worth County, Iowa, via Quebec, Canada, after sailing all the way up the St. Lawrence River by ship, a considerable lengthening of their entire voyage from Norway. This intrepid couple and their growing family started new lives in America, and though they could not read or write English, their children, as young as 1 year old, soon learned how! Sjur/Syvert is the father of Peder Stadem, who is the father of Alfred Stadem, the husband of Bergit Holbeck, who together brought forth the 9 Stadem sons and daughters that are featured in these Plain View Farm websites. There must have been a lot of Sjur and Oline's vim and vigor and vision in Alfred when he came along in the second generation to be born and raised in America, as the pioneering spirit remained strong in Alfred, who prided himself greatly on being a son of the pioneers. We will reprint some pages in this section, when there is time available to do it. 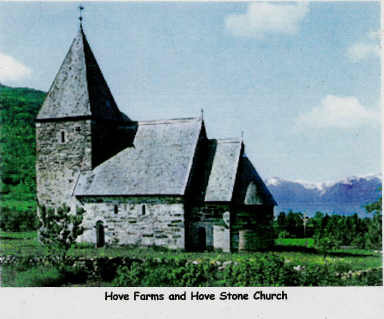 In connection with this book of Genealogy, which costs only $20 plus shipping of $2.70 postage, Barb Benson offers at no charge a Powerpoint Slide Show of the Stadem Ancestors and homes and churches in Norway, drawn from the Genealogy book, along with text. It can be emailed to you by contacting her. You can enjoy it free on your own computer. It can also be ordered from her for $25, in a book printed in color. She gave a book to Pearl Ginther for her 100th birthday, and it is well worth the $25, which is the cost of printing it out herself. You and your family will love the printed out version, which makes a great Christmas gift! The Stadem (Stadheim) Farms are in Yellow Highlight on Right of the Fjord in Enlargement. 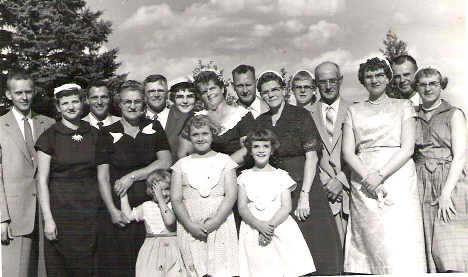 Barb Benson is in this picture of the Vorseth families, along with her mother and father and sisters. Can you pick her out? She is the cutest little girl in the picture, with the biggest smile! Using her book, we have identified the three Koistinen graduates from Bryant High School, shown in the graduation class pictures in the May 13 issue of the BRYANT DAKOTAN, as cousins! There are two lines of these Koistinens, descending from Anna Sophie Stadem, youngest daughter of Oline and Sjur Stadheim (Stadem). 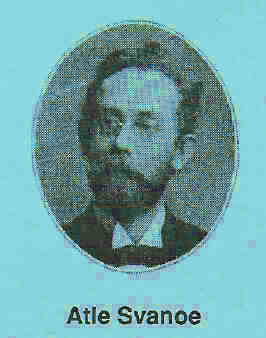 Anna married Erik Hanger. They had eight daughters. Two were Edna Hanger and Anna Hanger. They both married Koistinens. There you have it! Thanks, Barb! Now we can tell our cousins, the Koistinens, who have just graduated, and we would like to see the Koistinens and the other families descended from the Hangers come to our reunions too! They are most welcome! By the way, a Koistinen family owns and operates a brand-new motel in Hayti, SD, which is not far from Bryant. Perhaps they are also relatives. 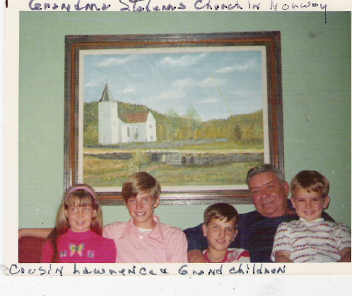 Cousin Barbara Benson, our Stadem Genealogist, is descended from Andrew Vorseth and Martha Stadem. 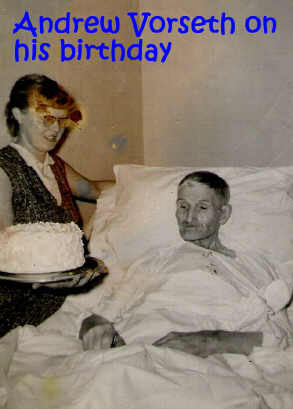 Her grandfather is shown here receiving a no doubt delicious birthday cake in a local nursing facility. Pearl Stadem Ginther has a new story, on how she got minnows from her Uncle Andrew Vorseth for the pond on Plain View Farm! Please go to the Pearl's Stories section below for it and others. RETURN OF STADEMS' BLESSING TO NORWAY! 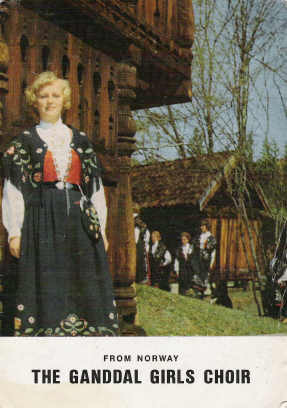 The Ganddal Girls Choir from Norway a while back came over to our country in their beautiful clothing, which has to be one of the more beautiful costumes worn by Norwegians. We are presently enjoying a cassette recording of their concert, done in the 1980's and still sounding clear and beautiful. 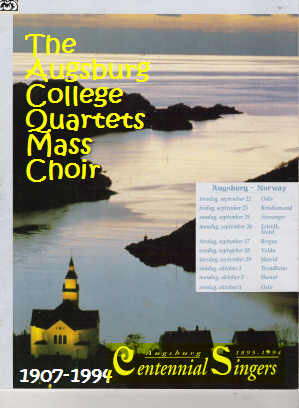 They sang a medley of Norwegian songs and American patriotic songs, as well as the Hallelujah chorus from Handel's Messiah. This cassette will be recorded on disc and saved for the Russell Schaefer Archives at the Heritage Center. 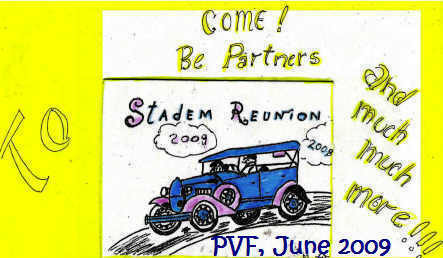 We also have a video of the Stadem daughters of Alfred and Bergit Stadem, including granddaughter Mim Rinderknecht, reading the PVF stories, while on PVF! We hope to have it transferred to DVDs, so it can be available to users of laptops. IMPORTANT NOTICE: CHILDREN'S STORY BOOKS AND ILLUSTRATORS CALLED FOR (IN PRAYER! ), PLEASE COME FORWARD TO GET THESE MARVELOUS STORIES OF PEARL GINTHER OUT TO THE CHILDREN OF THIS COUNTRY AND THE WORLD! WE HAVE WONDERFUL ARTISTS RIGHT IN OUR OWN STADEM FAMILIES, AND MAYBE THEY COULD DO IT, BUT WE NEED SOMEBODY WHO IS WILLING, WITH A HEART FOR CHILDREN AND HAVING A DESIRE THAT JESUS TO BE MADE REAL TO THEM. 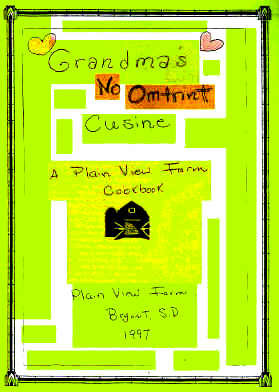 LET US KNOW WHO IS THE ONE TO DO THIS PLAIN VIEW FARM CHILDREN'S BOOK SERIES, USING ILLUSTRATIONS, BY CONTACTING PEARL GINTHER OR ELOISE HEFTY. THEY COULD ALSO BE USED FOR ANIMATIONS ON CDS OR VIDEOS AND PLAYED ON PBS FOR CHILDREN. A BIG CHALLENGE FOR YOU: TRY AND FIND BETTER STORIES TODAY THAN THESE! PEARL GINTHER WOULD LIKE TO SEE THESE STORIES PUBLISHED OR EVEN ANIMATED SO THAT ROYALTIES INCOME EARNED COULD GO TO PLAIN VIEW FARM AND ALL THE ACTIVITIES AT THE HERITAGE CENTER. Pearl Stadem-Ginther, turned age 100, September 13, 2009, told her real-life stories of the Farm Life of Yore on Plain View Farm, Reunion 2006, with her great-grandchildren present! "How Pearl Got Rid of Rats on the Farm"
"How Pearl Got the Fishes for Papa's Pond"
"I was on my way to school, riding the horse alone because Bernice was sick and couldn't go. She was only six and I was seven. 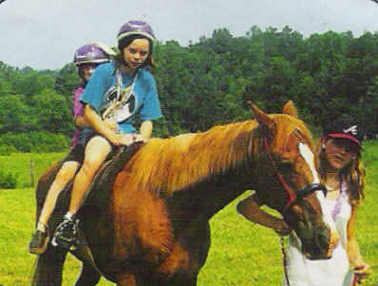 We rode across country, not by the road, as that was the shortest way, and it wasn't far. But as we got to the hill just beyond the barn the horse laid down! I couldn't get him to go, so I tried all I could to get him going. I shouted, and "nudged" him with my foot, and "patted" him with my hand, but he wouldn't go. I had to run all the way to school so I wouldn't be tardy, but I made it on time. I looked back once on my run, and saw him get up and look back at me, then he went home. Evidently, he felt something was wrong when Bernice wasn't on his back, and he refused to carry me alone. He was okay the next day, though, and took us both all the way to school." "Don't cry over spilt milk," is a common saying. How about if it is the more expensive cream? Can you cry then? One day Pearl and her Mama went to town with the cows' cream to sell. It was very heavy stuff filling a big metal can, and so the can was not easy for a ten year old Pearl to lift into the back of the surrey, a horse drawn buggy which has an open back, not like the wagon. They had made the trip before in the surrey without a hitch, but this time it was going to be a bit different. Before they could reach town they hit a bump. Out fell the big can of cream and over into the ditch! The can came open and the cream spilled out! What to do? Cry over spilt cream? No! Pearl quickly scooped up all the cream she could back into the can. What saved it from being lost was that the cream spilled out on thick grass, so it didn't sink into the ground. Soon Pearl had most of it back in the can. They continued to town, and Mama, honest soul that she was in everything she did, told the man at the market what had happened. She was so concerned. Would he still want to buy the cream? Oh, that's no problem! the man assured her. He would put it in their Separator, a machine that cleaned and made it, removing all the bits of grass. So the cream was saved and Mama got the money they needed! Mama Stadem and daughter Pearl rode happily back to the farm with the money for the cream in Mama's purse. "How Pearl Got Home in the Dark..."
"How Pearl Stopped a Runaway Windmill"
Sven was going for his morning walk one day when he walked past Ole's house and saw a sign that said, "Boat For Sale." This confused Sven because he knew that Ole didn't own a boat, so he finally decided to go in and ask Ole about it. "Hey, Ole," said Sven, "I noticed da sign in your yard dat says 'Boat For Sale', but ya don't even have a boat. All ya have is your old John Deere tractor and combine." Ole replied, "Yup, and dey're boat for sale." 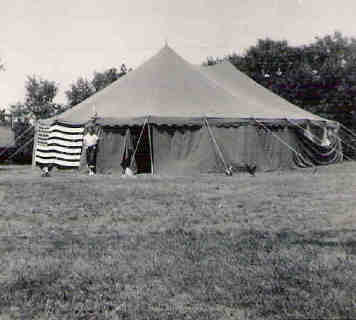 LIZ AND LEROY STADEM PERFORMED THEIR OWN VERSION OF CLASSIC NORWEGIAN-AMERICAN COMIC CHARACTERS "PER AND LENA" THIS LAST REUNION ON THE FARM IN 2007. LIFE-SIZE FIGURES OF THEM ARE FEATURED AT A LOG HOUSE IN THE BLACK HILLS AREA. SOME OF THE OLDEST MAY ALSO REMEMBER "PER AND OLA" FEATURED IN THE "FUNNIES" OF THE RURAL DAKOTA TOWN PAPERS FOLKS HAD ON THE KITCHEN TABLES AND ALL ENJOYED THERE. 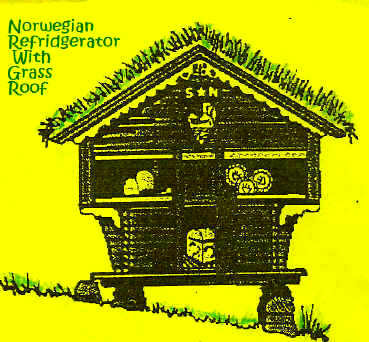 OUR STADEM FAMILY WAS NO DIFFERENT--AND HERE IS A LITTLE TASTE OF SCANDINAVIANS POKING FUN AT THEMSELVES GOOD HUMOREDLY AND NOT OFF-COLOR EITHER. PEARL GINTHER-STADEM, THE OLDEST IN THE STADEM CLAN, AGE 98, RELATES HOW SHE WOULD GO TO THE MAIL BOX A MILE FROM THE FARM AND ALWAYS ENJOY THE PER AND OLA IN THE PAPER AND THEN PROCEED HOME--HAVING HAD HER WELCOME BIT OF AMUSEMENT FOR THE DAY, WHICH ENLIVENED A ROUTINE TASK, GETTING AND BRINGING BACK THE MAIL WITH A LONG WALK! "Per and Ola," Back by "Popular Demand"
"Why do watermellons have water in them? Why because they were planted in the spring!" "Why do cows wear bells? Their horns won't work!" "Do you know what happens to a sheep when he goes to get a hair cut? He goes to the Baa Baa shop." NORWEGIAN DONUT SEEDS--AMAZING NEW SCIENTIFIC DISCOVERY! Any sunny location, preferably close to a coffee shop. Any time of year is good, but iced donuts grow best when planted in the winter. Plant in several rows, five feet apart and at least 10 feet deep. For best results use 2 NORWEGIANS, one to do the actual digging, the other to supervise and make out the reports for the Government Office of Agriculture--Donut Seed Division. Should you prefer glazed donuts, sprinkle each donut blossom with one teaspoon of sugar. Many diet-conscious Norwegians use sugar substitutes, however a touch of whipping cream creates a better flavor. It is feared that individuals associated with the International Donut Institute of Transylvannia (IDIOT) may have mixed common breakfast cereal into our seed stock. For your own protection please test out your donut seeds. If they float in milk and go well with fruit like bananas (peeled), they are breakfast cereal. If they sink immediately like rocks and turn the milk a purplish and greenish color, they are Norwegian donut seeds. 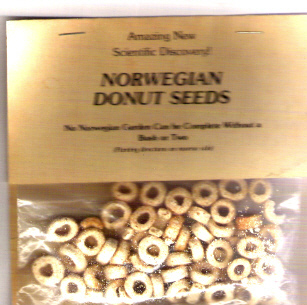 If for any reason you are not 100% satisfied, dig up the seeds and return them this package UNOPENED, to the American-Norwegian Donut Seed Society for full refund, or the equivalent in value of pickled herrings. THIS GUARANTEE IS VOID AFTER PURCHASE. For even more wacky but CLEAN Scandinavian humor, you might check out our "Scandin-Avian" toons about an odd extraterrestrial, duck-like species that supposedly invaded Scandinavian countries and took on (or brought with it) Scandinavian characteristics, even coming to love lefse and lutefisk and the use of the single swear word, "Uffdah!"! Scandinavia: Duck Heaven Toon Central"
Norwegians, not the more reserved Swedes, are justly famed for their offbeat (but not off-color) humor. In Washington State, we had a Norwegian humorist in Seattle and the Pacific Northwest for many years whose name was well-known to thousands. But even closer to home, we have a dear friend of the Ginthers, June Durnell, who puts on Norwegian costumes and gives humorous monologues with a thick Norwegian accent that could curdle cream. 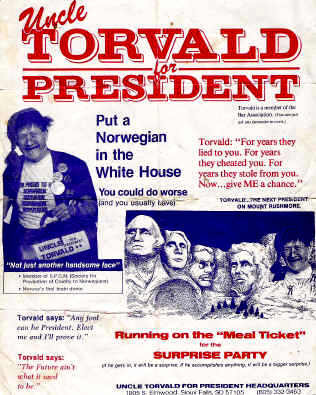 Here is one good specimen of Norwegian humor from South Dakota: "Torvald for President!" A new center and page is added to our site called "Archives of Heritage Center," featuring many items we post first on this page, then moved to the Archives Heritage Center page. Listed on the Archives Page: There is a Liberty Township History article now available, researched and written by the pupils of Dist. 124 school in Liberty Township, Day County (in NE South Dakota, near Webster, between Aberdeen and Watertown). This article compares very closely with the experience of settlers of the Bryant area. 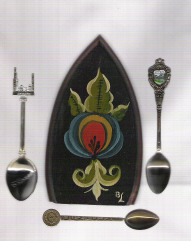 We have many new items, among them "Bernice and Russell Schaefer's Letter to Luther Svanoe," June 19, 1994, and Cora Fjelstad's Funeral Service and Bio. 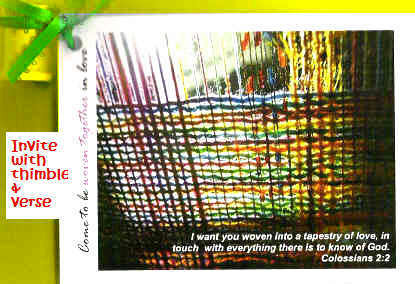 "Dear Sis Pearl, Thank you for your card and writing to me on my 82nd Birthday. Yes, it's 82. You outlived Mama and I have gone past Papa's age. Don't you think about how our parents gave up so much for us kids. And how they grew in their love for the Lord and others. Can't forget how Papa asked Ben and Norman to kneel with him and pray for the Lord to take away their drinking habit--AND THEY DID AND HE DID! Yes, Sister--you have been a blessing in countless ways. To be the oldest wasn't always easy, I'm sure. It was such a highlight when you and Bob and the Kids would come home at Christmas, and other times too. Yes, Pearl, I feel young too. Glad you do too. Liz is making tea for me and then I go play tennis. Sunday I take over the services at Freeman about 50 miles SW of S. Falls. They are a small group, but appreciative. Wish they would have a nice church as your little white church. My how nice it was to meet there [in the restored chapel of the Mt. Lutheran congregation where Pearl has been a member for 66 years] for Norwegian pancakes and the fellowship meeting. You did right to save it. I'll let Liz write a little too. Love you! Greet everyone." "Hi there, Pearl honey. Ron tells us you are a little more confined. But you have a beautiful new chair. We hope you are enjoying it. We have to tell friends about our great 100 yr. old sis in Washington, and of the great children who put on the most wonderful party. Leroy and I keep busy. 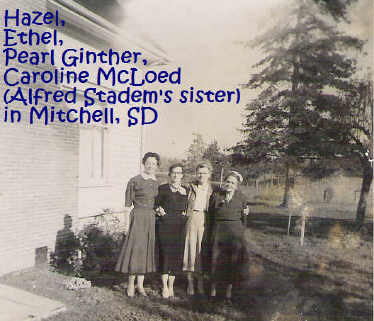 Tomorrow, Steve's wife and I will go to 1st Lutheran Bazaar [First Lutheran Church was Pearl and Bob Ginther's church when they lived in Sioux Falls in the thirties, up to 1942]. It's the greatest. Then in the afternoon, Augustana [College] has a big game at their new stadium. Vets are being honored, so Leroy will go. Bless you hon. Keep up your good work. Love, Liz"
Pearl Stadem Ginther is known for asking people whether they they are ready to go through the Pearly Gates of heaven. 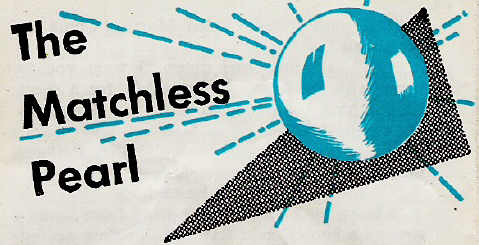 The following account is called "The Matchless Pearl," and tells the story of a Indian diver and the huge, perfect pearl his son found, which he wanted to give to a beloved missionary friend for nothing, since the pearl had cost his son his life and he could not sell it or let it go for any amount of money. Read how the missionary responded. You will be surprised, just as the old father was who was offering the treasure as a free gift. The Stadem Family Photo Abum is a must-see! 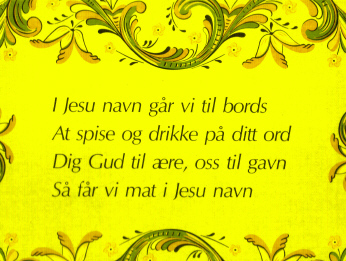 Can you read this Norwegian grace? If you took Norwegian in school (I took a year in college, but needed more to really get it under my belt! 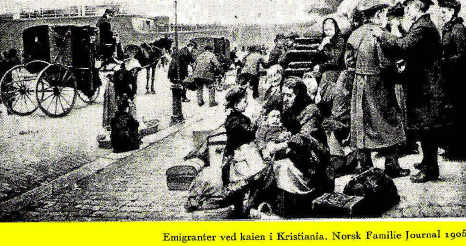 ), or picked it up from Norwegian-descent parents, you are fortunate. The rest of us can guess, or use Google's translator. "Mama's Perfect Day," to find out exactly how Mama Bergit Stadem's day went from dawn to dark. Don't miss it, you will be out of breath when you get through seeing what a whirlwind of activity she really was, though she moved so slowly you would think she could never get it all done! Eat and drink of Your Word. We then receive food in Jesus' Name. How about some Rommegrot? It sounds awful, and looks like something so bland, you might not like it, being made of primarily flour and milk. But despite how it looks or how it is named, it is delicious! So delicate in flavors, it simply melts in the mouth, as anyone who has had a real dish of it can testify. Here is the recipe from First Lutheran Church of Sioux Falls, SD., which Pearl Ginther offers to you all with her Nowegian blessing! 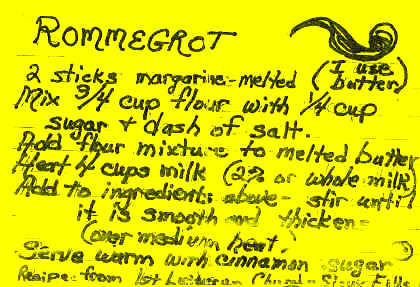 If you have ever had a bowl of Rommegrot, you are hooked for life! Yew tak yust ten big potatoes. Den yew boil dem till dar done. You add to dis some sweet cream an' by cups it measures vun. Den yew steal tree ounze of butter and vit two fingers pinch some salt. Yew beat dis very lightly, if it ain't gude it is your fault. Den yew roll dis tin vit flour and light brown on stove you bake. Now call in all Scandihuvians tew try da fine lefse yew make. 1 Lemon, 2 tsp flour, 1 cup sugar, 1 tbsp butter, 1 cup milk, 2 eggs. Cream butter and sugar, add, separate eggs, mix yolks with sugar and grated rind. Add cup milk and finish with beaten whites of eggs. Bake in 1 unbaked crust in moderate oven. We celebrate the epic struggles and achievement of our Bryant area pioneers! They left "giant footprints", indeed, after they turned a howling wilderness into a place where children could safely run and play, leaving to their descendants farms that could feed a nation and a world with good corn and wheat and livestock. Yes, during the same period the wonderful buffalo were driven off and killed by bounty hunters following a cruel campaign against the native Indian tribes--we cannot be thankful for that--but God's bounty and blessings are not diminished by what erring and greedy people do to spoil what God has given all men to enjoy. And in many places the magnificent buffalos are making a great comeback--thanks to their superior ability to survive and flourish on scant forage where domesticated cattle cannot live without food being brought in during bad weather. We can only try to be good neighbors to the Indians, wherever they now reside. Let not forget them, though the reservations are out of sight mostly, and thus out of mind to most Americans! There is much we can do, individually, and together, to give them a hand up in the ways they appreciate help. 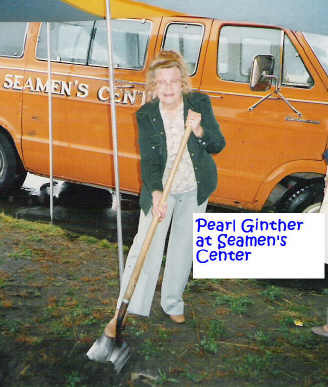 Seamen Center: "Pearl Ginther Celebrates 100 Years 9/13/1909 - 9/13/2009"
The Buffalo Mound Home Page, with Truly Wonderful Bernice Stadem-Schaefer's Memories of the Folks, Papa and Mama, and PVF, also Pearl's Stories, Et Cet. Please check out this Reunion Report for July 10, 2002, as it relates Bernice's truly great Christian legacy and achievements on the Farm supporting the Reunions for many years with her gifts of merriment, homemade-bread by the dozens of loaves, UNIQUE family anniversary, births, weddings, and other celebration signs and decorations, and her unforgettable self in faithful attendance year after year from the 1980s to the 21st century. Except for one or maybe two instances, she was never paid for her services and labors of love all those years, bearing the considerable expense for her travels and costs of preparing for the reunions all those years! Can we not now try to repay the debt we owe her, in part at least, by commemorating this wonderful lady we were all privileged to know and receive so much love from? Someone out there in the relationship can surely come up with a gift that will establish a lasting memorial to her on the Farm! Come now, you are perfectly able to do it, many of you? You received much, so much is expected of you in return. Pass it on! Don't keep what you were given so lavishly. PASS THE LOVE LIGHT ON! IF YOU DON'T IT WILL EXPIRE IN YOUR HANDS, AND THEN WHAT WILL YOU HAVE, A BURNT OUT CANDLE! PLEASE DON'T DO THAT, FOR THE SAKE OF YOUR CHILDREN AND ALL YOUR LOVED ONES. IF IT IS IN YOUR ABILITY, DO ALL YOU CAN, UNGRUDGINGLY, WITH A WHOLE AND GRATEFUL HEART. PASS IT ON NOW!! 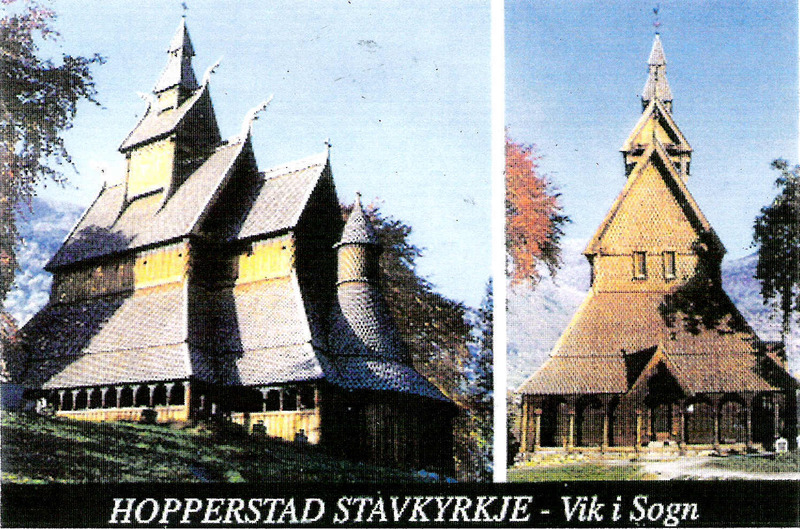 Take a self-guided tour of Old Norway without the expense of plane or cruise ship--just plump right down on the comfy, old rocker in the parlor and look at wonders of nature and man's making through our Plain View Farm stereoscope, just like they did at the turn of the century (the 20th, that is). PLAIN VIEW FARM HERITAGE CENTER WILL SOMEDAY HAVE A GLASS SHOWCASE FEATURING EMBROIDERIES AND LACES BY STADEMS AND HOLBECKS. 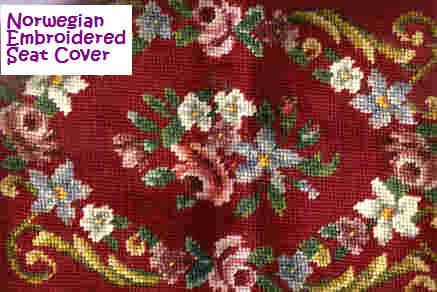 PEARL STADEM GINTHER HAS GIVEN HER OWN COLLECTION TO IT, AND SHE HAS OVER FIFTY EXAMPLES OF THIS FINE ART FORM OF THE SCANDINAVIANS. JUST A FEW CAN BE SHOWN HERE ON THESE WEBSITE PAGES FOR NOW. You are most welcome too to browse (like that grazing quality of the verb!) 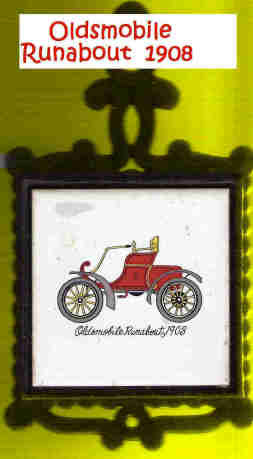 our guestbook entries going back 16 years or so, which we have collected on a special page here for you on this site. Take a Gander at Guestbook Entries Back to 1998, or Thereabouts! The Reunion for 2009 was a great success, with fifty present. Please go to the September Samtaleren for Rennard Svanoe's article. Also the Bryant Dakotan paper for September carries his article and an update about the Heritage Center submitted by Ronald Ginther. Rennard's article is offered here on this page. We will also offer the article attached to it as soon as we can. Please look for it here soon. Don't be so over-awed by our culture and its media, not all Scandinavians, and not all Lutherans, support attacks on Israel and the dismemberment of its remaining, tiny territory to accommodate a preposterous, terrorist-led Palestinian nation that never before existed in recorded history! In a parade in Jerusalem, Finnish Zionists (no doubt all dedicated Christians) show their ardent support of Israel and the Jews. We too, as Norwegian descendants, also support Israel and God's people ardently! We pray God bless and keep Israel, and protect God's people wherever they are, but especially those in Israel, where they are under constant, increasing attack by rockets and bomb-carrying terrorists of Gaza and Southern Lebanon's Hezbollah terrorists, as well as by hostile Muslim dictatorships all around Israel and the even more dangerous, fanatical Muslim mullahs of Iran! Whoever blesses Israel, will be blessed, God's holy word says. Whoever curses Israel will be cursed, God's Word also warns us. God set it up that way, and we respect God and His ways, for they are absolutely right, and men's ways are absolutely wrong then they come in opposition to God's holy, perfect ways and commandments. Thank God that some Scandinavians, our dear Finnish brethren, have got it right! They are a brave, shining example to all us Scandinavians, are they not? Sadly, fewer and fewer Christian Scandinavians will agree, as Israel is continuing to be denounced by the world community and the United Nations particularly is attempting to label Zionism racist. If you are a Zionist, according to an article in THE LUTHERAN, June 2009, you are "challenging our Lutheran commitments." 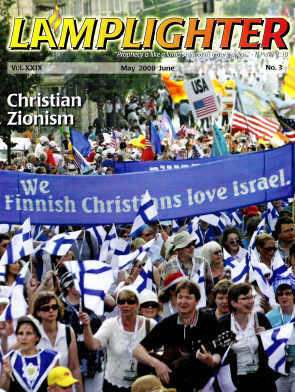 This is the official ELCA publication, stating the position that the church body has taken regarding Christian Zionism. In other words, the ELCA is anti-Israel. How can this be, when Israel is the homeland of Jesus Christ our Savior? It is the land that the God of Abraham, Isaac, and Jacob promised to the Jews for their possession forever. That covenant is everlasting and God swore by Himself to uphold it, and so it cannot be revoked by man. How can we stand against our Lord's own people and covenanted land? We would rather die than commit such a heinous crime! Nothing in the Bible or our own conscience could excuse us if we did such a terrible thing. Now we know that King David's kingdom and holdings extended far beyond what Israel's borders consist of today, but even then they did not comprise all that God had granted Israel his people. But just consider the land presently in the hands of the Israelis. Is that land Israel's by rights? Or is it "occupied" illegally against international law? That is the claim by its Muslim neighbors, and the various terrorist organizations of Hezbollah, Hamas, Fatah, and others. The finest article we have read of many so far has to be "Where Does Israel Get the Right to Claim Palestine" by Wim Malgo, the 1974 Founder of Midnight Call Ministries. He lists nine reasons for Israel's right to Eretz Israel (its true name, not Palestine, which is a very derogatory Roman name used mostly today by Gentiles [though Wim Malgo uses it too, in order to frame the question as a Gentile would frame it), just as "marranos" is a term used for Portuguese and Spanish Jews today that translates as "swine"). Just this little bit to chew on: Wim Malgo writes: "The fact that Israel's rights are in heaven and on earth makes this people the greatest mystery of the millennium, but also the object of the hatred and miscalculation of the nations." You heard probably that some marriages are "made in heaven." Well, this is the only nation "made in heaven." The Bible says so! No wonder the Gentile, Made-On-Earth-Only nations are envious, jealous, and even openly hostile to heaven-born Israel! Doesn't that explain it, why the Jews are so hated throughout the Gentile world today and for the last 2,000 years have been so persecuted? As long as an Israel exists on the map, as long as the Jews exist as a people, these facts shout in the face Satan the fallen archangel, the prince of darkness, who seeks and fights for total control over the world. We will offer this article soon on-line. 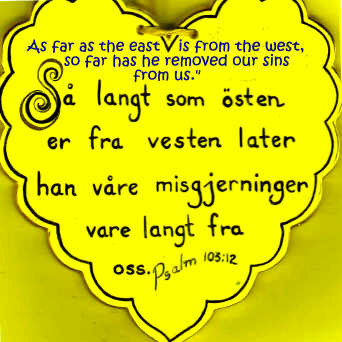 We also invite you to go to the fine, biblical-based articles from the same magazine when they come on-line here entitled: "God's Word is Our Great Heritage," by David R. Barnhart, Founder and Publisher of Abiding Word Ministries, "The Word, Committed to Its Authority," by Dr. Francis Monseth, Dean of the Association Free Lutheran Theological Seminary of Medicine Lake, Minnesota, "When Does a Church Cease to be a Church," by David R. Barnhart, and "What Does It Mean to be a Lutheran," by Calvin D. G. Willard, Pastor of Free Lutheran Church of Roseau, Minnesota. 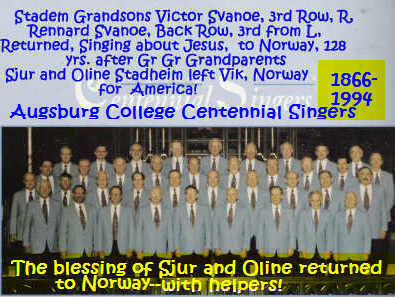 Rennard Svanoe's Norwegian grandfather is Rev. Atle Svanoe. 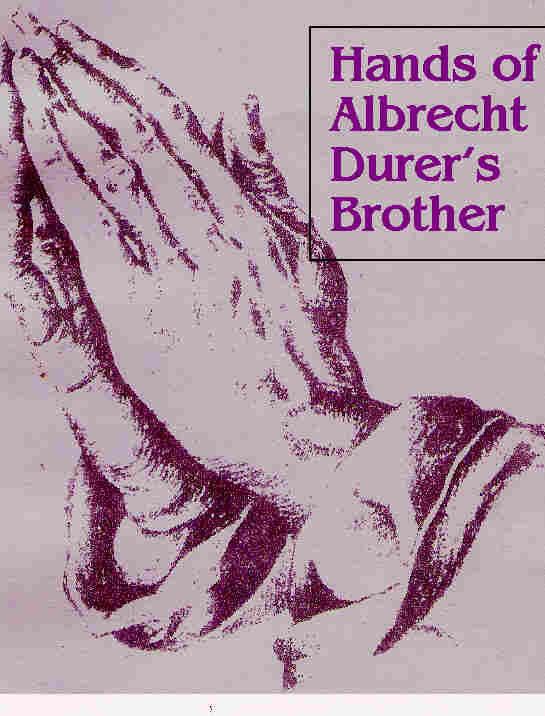 He wrote a notable book just after the turn of the 19th century about lay ministry in the Lutheran churches. We highly recommend this book to you to read and consider implementing in your own churches and fellowships. Atle Svanoe was a man of God who truly put his finger on the need for spiritual growth and training and encouragement by laymen's ministry. The prophetic gifts are also highly emphasized. Much reference is given to Luther, who was concerned about laymen's ministry and rued that he didn't see enough of it in his churches. Hundreds of years later, the need is just as desperate, or more desperate for lay renewal and lay ministry in the Body of Christ. Does this spark some interest in you? It should, if you have observed both in yourself and in the church membership of your own church these symptoms you find listed in the Sardis church, which Pastor/Author Atle Svanoe takes to be the church we most resemble. Uffdah! Double Uffdah!! Sardis was the church John the Revelator wrote about, to which Jesus gives very stern warnings, saying that they appear to be alive but are dead. Nevertheless, some are faithful and will later receive white robes and crowns. Isn't that a picture of today's churches?--they seem to be alive but are mostly spiritually dead? If you don't think so, consider the latest statistics, that show the evangelical churches are continuing to decline, while the non-churched, non-Christian population is growing. 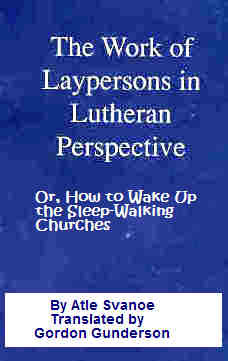 You might also refer to Clarene Kopp's article we have in the Archives concerning the Bethlehem Babe and the response to him in Lutheran churches of his purview, for they dovetail right along with what Atle Svanoe says in his books about the woeful decline of spirituality in the church people of his time, both in America and Norway. 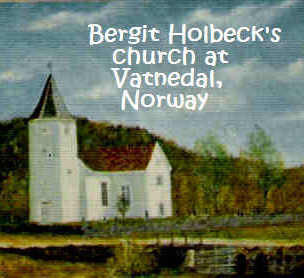 Grandma Bergit Stadem also saw the decline way back in the early 1900s, so and remarked about it being so cold in the church at Vatnedal. Her family would go to another church, taking some effort to reach, just to be in a church where the people still loved God and their fellow man. Omnipress, Madison Wisconsin, published this truly dynamic little book, and you may be able to order a copy or copies from them directly. You might try Amazon.com too. Or write to Rennard Svanoe concerning a copy for yourself, as he should know how to obtain one, or he might even have copies available to send to you on request. Please give him a suitable donation to cover the expense fo the book and the shipping. The publishing was done all at his own expense, so he will probably appreciate reimbursement from you. Even more alarming trends in the Sardis-like church of today have resulted in the endorsement by the Assembly of the ELCA, voting to endorse practicing homosexuals as pastors, interns, teachers, and deacons. Many hundreds of churches have already left the ELCA, such as the 6,800 member Community of Joy ELCA congregation of Phoenix, Arizona, concerning the ELCA not holding to the inerrant Word of God (the historic Lutheran view that the Bible does not have mistakes). But this endorsement of practicing homosexuals, approving the depravity that scriptures clearly call sin that needs to be repented of, is the last straw for many, many more churches and congregations. 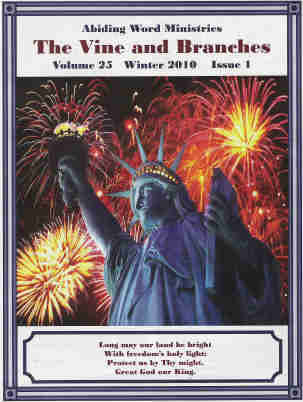 Go to the Abiding Life Ministry's magazine, VINE AND BRANCHES, for the reports about them. 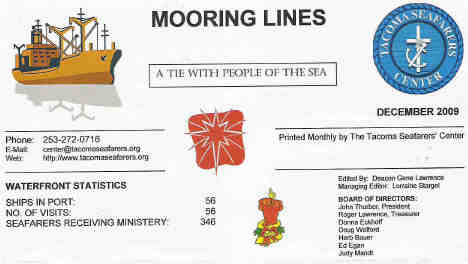 You can reach this fine ministry and obtain free copies of its magazines, by going to the Abiding Life Ministry website. Though still the largest Lutheran denomination, the ELCA membership has been declining by the hundreds of thousands. It will decline even moreso now, just as the Episcopal Church (USA) did after it endorsed practicing homosexual bishops. Pearl Ginther has not approved of sin and what the Bible calls sin. Imagine, having homosexuality taught to the children as something God can bless! That is simply horrific! Imagine, homosexual "marriages" being approved of, recommended, to children that are somehow just as good as the only one man and one woman marriage that God instituted in the Garden of Eden! Is Jesus going to approve of this? It is unthinkable. To even entertain the idea that such practices are not sin and are now right and acceptable, that shows we have accepted the worldly views of the non-Christian, non-biblical culture, which is not holding to the truths of the Bible and has long abandoned the God of Abraham, Isaac, and Jacob, not to mention Martin Luther, and our own grandparents Alfred and Bergit Stadem! You can go another direction on this if you choose, friend, but that is going another direction from the way God set in his word, the Holy Bible. No amount of laws, passed by church or state, can revise or change or annul God's Word. It is the utmost height of man's pride to think we puny creatures can change God's everlasting laws or come up with "something better" than the Ten Commandments to rule society and churches by! Scripture says that heaven and earth will pass away, but God's word will not pass away. Pearl Ginther, praying: "I take authority against the Enemy right now in Jesus's Name, that the Devil get off their [the ELCA leadership's] backs and leave them alone, and that they will turn their hearts over to God, that Jesus is the Way, the Truth, and the Life. "No one comes to the Father but by Me," he said. Praise His holy Name! I can't see the children going through anything like this! Jesus said, "If anyone offends these little ones of Mine, it would be better for that man that a millstone be hung around his neck and he be cast into the midst of the sea." What we need to do is accept Jesus our Precious Savior into our hearts and lives, and He will bless us because he hears from anyone and salvation will come by trusting Jesus as our personal Savior. Homosexuality is to be driven out by the Holy Spirit, so that the people will truly go the right way by taking Jesus into their hearts." Knowing that many are in this controversy with lifelong membership in the ELCA, some with even pastorates, and innumerable friends also in the same denomination, our prayers are with you all, loved ones. As for the U.S. Government which is a runaway one, turning aside from God's commandments and even common sense to oppress the people with a labrinthine system of unjust laws and ever increasing taxation, we pray also for our leaders, foolish as they have proven to be. Nancy Pelosi, Speaker of the House, Harry Reid, Barbara Boxer, Adam Smith, Patty Murray, all the Democrats and even some Republicans who have abandoned God as Sovereign over America and their affairs in Congress, we pray for them, because they are ignorant of God and wouldn't do these terrible things they are presently doing if they truly knew God and what evil they are doing. They say they are doing all this for the good of Americans, so why are they being threatened with death threats (which are not really coming from conservatives, as they claim) but from their own disenchanted Democrat constituency)? They charge conservative leaders and whistleblowers, who are true defenders of the Constitution, with inciting these attacks, however. Russ Limbaugh, as a very popular Radio Talk Show host and conservative, is their favorite target of accusation, since they know he speaks for millions of Americans who do not want to see America go bankrupt, or use tax money to fund universal abortion on demand (and enrich Planned Parenthood), and conduct needless stem cell research on human embryos (when you can use, as the Israelis have discovered, a patient's own cells to devise cures for that patient's particular cancer), amnesty for Federal law-breaking illegals from Mexico crossing our borders to gain free social services and jobs and all sorts of benefits that are bankrupting Americans and our states to pay for them--these are just a few of the issues, and we haven't even mentioned the government policies and impending bills to penalize anyone who doesn't buy health insurance with a big fine and possible jail time, nor their plan to tax businesses for carbon dioxide emissions ("Cap and Trade") and continue severe restrictions on drilling for oil in America's proven reserves, thus continuing our dependency on the oil of the terrorist-ridden Middle East reserves. All this constitutes a threat to our very existence as a nation, does it not? It is not "hope and change, but a recipe for utter disaster. None of us asked for this issue, nor like to be involved in any controversy, but like Joshua of old we must stand with God, on HIS side, not man's. We must choose this day, regarding this issue, exactly where we stand, and God and the Bible is our choice! Only in God, only in support of the Bible, do we find safety and a refuge and solid grounds for lasting happiness. Pastor David R. Barnhart, of Canal Winchester, Illinois, has a ministry to individuals and churches to help them deal with this issue and to find the way through it to God's will for them. He has helped many churches and many people, and is available to come and speak and counsel and offer his help. You may contact him through his website and magazine. Abiding Word Ministries, and "The Vine and Branches"
Abiding Word Ministries, 6380 Rossmore Land, P.O. Box 275, Canal Winchester, OH 43110. "Where does the time go? God has been so good to me to give me more years than I ever dreamed I would ever get, so have truly enjoyed every plus years looking forward to another glider ride Wayne has promised me 1 week before my 100th year. My, how I enjoyed the glider ride back when I was 90 years old!!!" Joke: "Why does it get so hot in a stadium after a baseball game? Answer: all the fans have left!!!" Joke: "I'm sure you know that seven days in bed make one weak." "Scripture: "I can do all things through Christ which strengtheneth me."--Phi. 5:13. 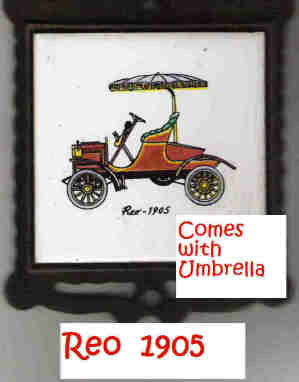 Here are some wonderful old cars Pearl Ginther saw, and she may even have ridden in! 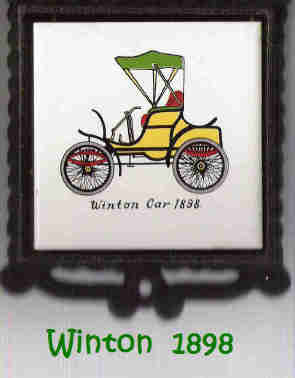 She recalls such old cars in her memory, cars known as the Winton, the Reo of 1905, and the Oldsmobile Runabout. She and Bob drove a Hupmobile too, by the way. When things improved enough to put the money aside for a new car, her folks became proud owners of a plum-purple Kaiser sedan, a powerfull car that was used to tow their Snuggery from SD to Mexico and all across SD and other states, which a trailor-home on wheels that featured all the modern conveniences, table, sink, beds bookcases, and a wood cook stove. 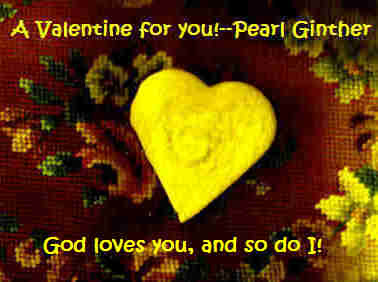 A Valentine's Day Cookie from Pearl Ginther to you!